Let’s go Dutch! But, let’s do it the proper Dutch way! 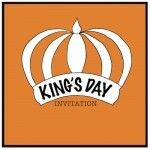 That said our invitation card for our King’s Day Party, for which I made my infamous Chips Dip.